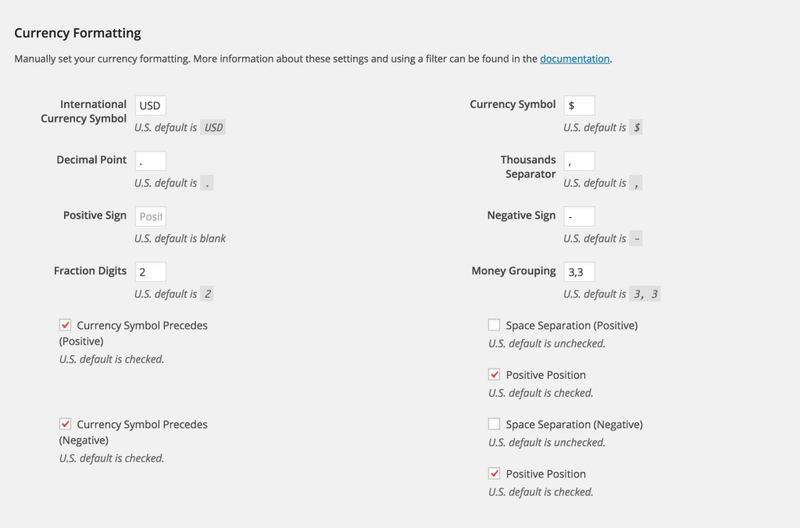 Before proceeding to advanced filters below use the General Settings page to set the default currency formatting for your site. As you can see by the screenshot below all options are available to you. Confirm that the client's currency formatting is set to "Default". Note: This option was added in version 4.4. The below troubleshooting guide is out-of-date since the options were added to the general settings page. Use them as examples only for an advanced setup. It's likely your server doesn't support, or is not properly setup for the localeconv() function. This filter will set the currency to USD for you, if you need a different currency formatting look at the other examples below. This is caused by your version of PHP not having the proper values from localeconv(). The resolution is manually setting the values manually, here is an example for those in the UK. localeconv() on Windows servers doesn't produce the results other fully supported servers produce, this is why you'll need to make sure to filter si_localeconv. Just like the other filters above, here's another example.